Anyone paying attention to the March 21 Harbor Commission’s appeal hearing on APM Terminals (part of the Danish shipping conglomerate Maersk) permit application to automate Pier 400 terminal would have noticed the display of re-framing the debate. In response to the uproar against their permit — against automation ­ APM Terminals has said their permit was valid and legal and broke no rules under the PMA Coastwise agreement with the ILWU and met the Port of Los Angeles requirements for a Title I permit. The Mechanization and Modernization Agreement, which was signed in 1960, distinguished between three classes of longshoremen workers. 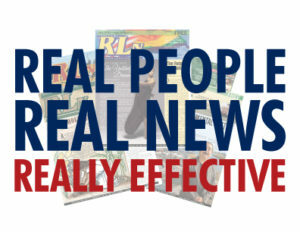 Depending on the level of the workers, each worker could guarantee a certain set of benefits. The three classes of longshoremen created by the agreement: “A” book workers who have full ILWU membership; “B” men, who are partially registered with the ILWU; and Casuals, who are not recognized as being attached to any aspect of the longshoremen industry and would only work peak days when the “A” men and “B” men lists were exhausted. These men could not claim any benefits as mentioned in the contract or in the M&M Agreement. Under the M&M Agreement employers were allowed to introduce new technology and devices that would improve the ports’ productivity, efficiency, and reduce the number of labor forces needed. In exchange, job security for the “A” book workers was guaranteed. If modernization resulted in job losses, those losses would first result in loss of employment for “B” men and Casual workers so as to prevent the loss of employment to the basic workforce. The M&M Agreement provided job security for ILWU members but it didn’t anticipate the degree of efficiency that would be achieved by the introduction of new technology and containerization at ports. By some estimates, the introduction of technology reduced the need for labor by up to 90 percent. If that weren’t enough, dock jobs were being placed outside of port areas, sparking jurisdictional disputes between different unions. Since the signing of the M&M Agreement, the ILWU has brought other unorganized, nonunion waterfront occupations into the union to counteract the corrosive effect new technology at ports is having on job security. The union has pushed back against the ticking time bomb effect of new technology and automation in subsequent contract years. The changes seen in the relationship between labor, employers and technology in the goods movement industry are changes seen in other industries affecting communities across the United States like auto manufacturing. 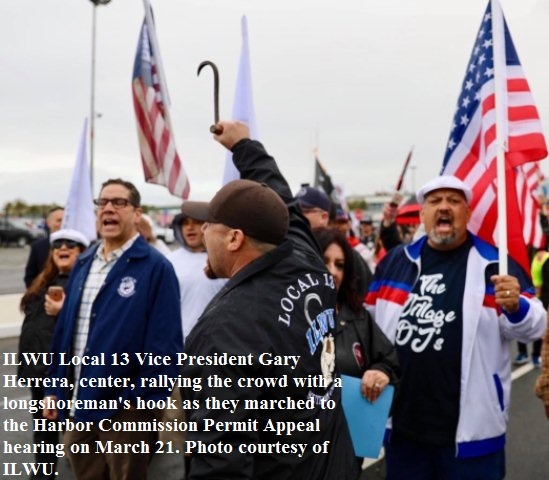 When the spokesman for APM Terminals John Ochs says, “There’s nothing in the Pacific Maritime Association’s Coastwise Contract that prevents the introduction of new technology or automation,” ILWU Local 13 vice president, Gary Herrera agrees. But Herrera argues that the permit appeal isn’t about the union’s contract, but about the impact automation will have on the local community. 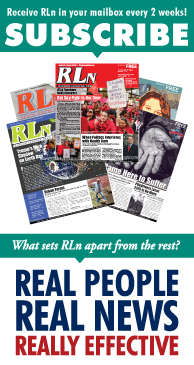 The fight against APM Terminals’ Title I permit is about a community rallying together to prevent the kind of crushing job losses that destroyed ways of life when the canneries and the shipyards closed down in the 1980s. One other point not to be overlooked is that POLA executive director Gene Seroka is a former long time employee of American President Lines, one of the leading shipping companies in the world and he signed the level I permit. It is also widely rumored that he is in line to become the executive director of the Pacific Merchant Shipping Association, which has brought some to ask whether this is a potential conflict of interest.